Why Didn’t He Kick It Into Row Z? Saturday 9th September 2017: Durham Gala. Thursday 14th September 2017: Washington Arts Centre. Football supporters are passionate people. They feel a sense of belonging. A sense of community. Here are 2 productions in one bill that explains what it has felt like to be a Sunderland supporter in recent times. 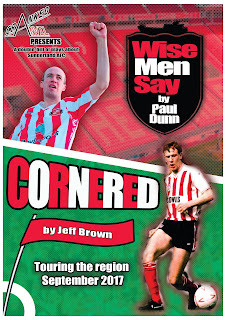 Now if you’re a football supporter then you’ll be able to relate to the highs and lows described in Wise Men Say. If you have ever played the beautiful game then you’ll appreciate the emotions described in Cornered. If you cannot see the point of 22 men kicking a ball then this is unlikely to convert you. So I should start by saying that I have supported a football side but it isn’t Sunderland. (No, I’m from Yorkshire and I believe there’s two things in life you cannot choose - the other is your family). But as a fan that has seen my club move from a scruffy old ground that was full of terraces to a modern stadium I appreciate where Paul Dunn is coming from. In Wise Men Say writer and performer Paul gives a largely positive view of the change to an all-seater stadium. Paul plays Jimmy Ian Henderson, a lifelong football fan who has worked out that he was conceived on the same day Sunderland lifted the FA Cup at Wembley. 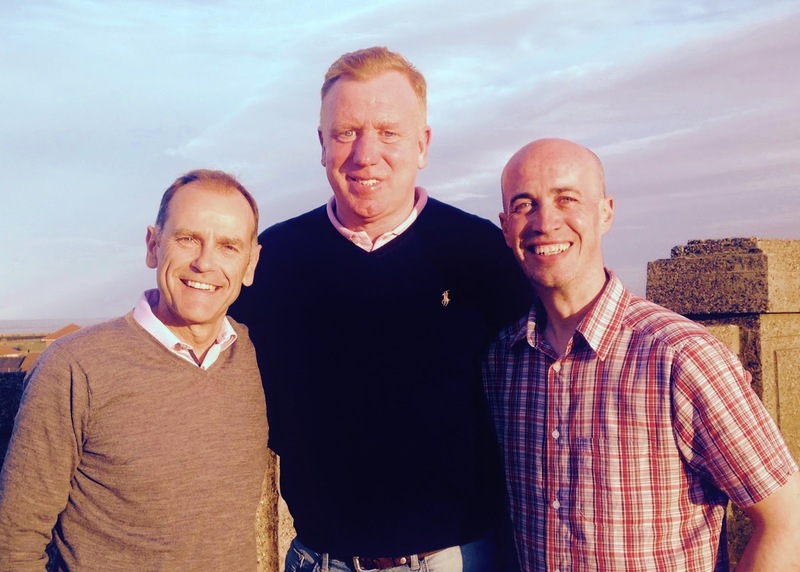 He is assisted on stage by Thomas Potts, as his son Kevin Niall Henderson, and Steve Arnott as a certain local policeman. Kevin had met his wife at a Sunderland game and they are awaiting the arrival of their first child. Jimmy is disappointed that Kevin doesn’t plan to get a season ticket even though it is the first time Kevin will have seen the lads in the second tier. 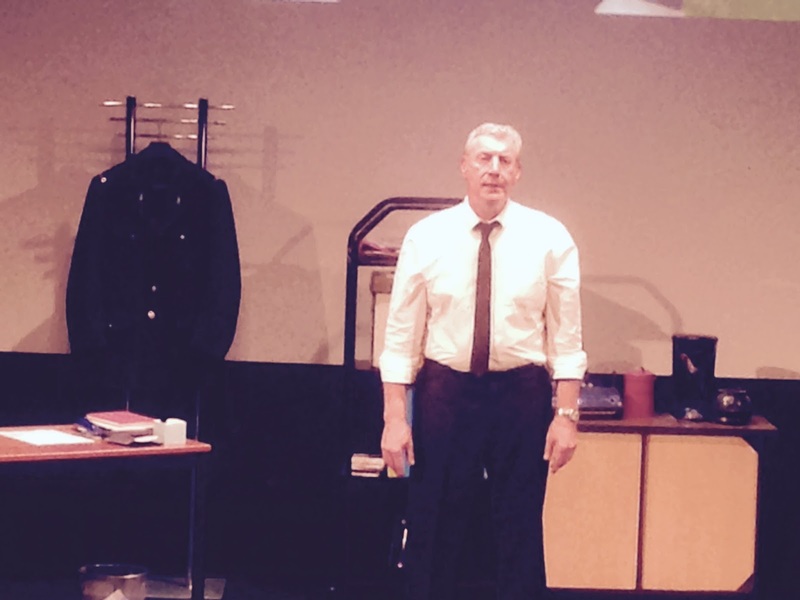 When Kevin leaves to see his wife we are left with Jimmy to reminisce with the audience about all things Sunderland. The romance of the first match with his Dad, and the responsibility of ensuring his son got to enjoy the same passion. But should a supporter still turn up when the team are not doing well? 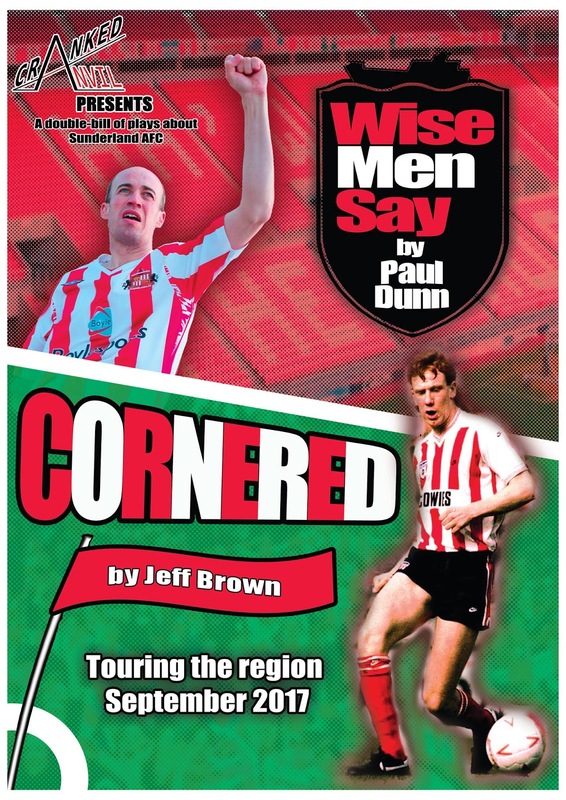 This is a passionate and believable performance by Paul Dunn on a topic that is close to the heart of the Wearside faithful. After the interval (half time?) we are transported back to the Milk Cup Final of 1985. In Cornered, by BBC Look North’s news and sports reporter Jeff Brown, the focus is on one incident by one player. Steve Arnott appears in the single hander as PC Dave Corner. The policeman’s previous life was as a Sunderland player and at the tender age of 18 he got the call to play on Wembley’s hallowed turf representing his home club. Unfortunately the day didn’t go quite as planned. In an era in which there were only 4 TV channels, and full length matches were a rare event, Dave was not just seen by the Wembley crowd, he was seen by millions. The incident started a series of events that resulted in Norwich City scoring the winning goal against Sunderland. Unfortunately the TV reply focussed on poor Dave Corner and fans have long memories. 1985 is a different era to that of modern football. Dave Corner lived close to the ground. He drank in the same bars as the fans. He was to face the incident on a regular basis as fans reminded him of it. More than a blow by blow account of the match, this is a study of the fans reactions as much as anything. Tonight’s show was witnessed by a number of Sunderland’s faithful and Steve Arnott’s performance reignited memories so much he was getting heckled by the audience. This seemed an unusual reaction to a theatrical performance but it shows how good Steve was as fans were reacting like he was Dave Corner himself. The show finished with a Q&A session between writer Jeff and Dave Corner himself. This interview brought the story up to date. It was a good night’s entertainment for the football fan. The target audience may not be theatre regulars and, as such, it should be welcomed as it brought in a different crowd. Performance dates are: 6th-8thSep: Customs House South Shields. 9th Sep: Durham Gala. 14th Sep: Washington Arts Centre. 22nd Sep: The Peacock, Sunderland. Prices range from £7 to £16. Tickets for all performances are available online, via company’s website: www.crankedanvil.co.uk.